Limited run? Check. Boutique manufacturer with a solid reputation among cigar enthusiasts? Check. Outrageous packaging requiring a sizable investment without the opportunity to first try a single? Check. Tweaking existing blends to create exclusivity? Check. If there were ever a product release that just screams “FOR CIGAR NERDS ONLY,” the Broadleaf Collection from Pete Johnson’s famed Tatuaje brand is it. Fortunately, after burning through quite a few of these, I am happy to report I consider this purchase money well spent. As we’ve noted previously, with the FDA deadline just days away at the time, the 2016 IPCPR Trade Show saw a flurry of new cigar announcements, as expected. Tatuaje was no exception. And I don’t think I have to go out on a limb when I say fans of Tatuaje were most excited for the new Tatuaje Reserva Broadleaf Collection. Rightfully so. 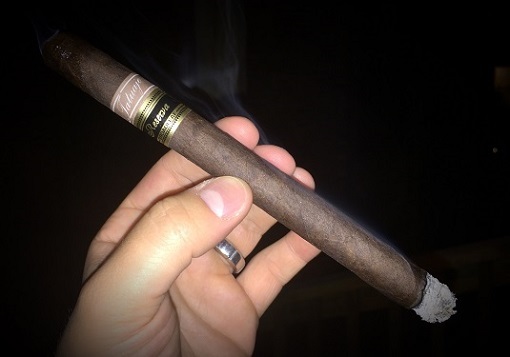 The Reserva Broadleaf Collection consists of a whopping 100 cigars selling for $1,200, featuring ten each of the six original Miami Seleccion de Cazador (Brown Label) “HUNTER” sizes, plus the J21, SW, K222, and Cojonu 2003 blends (check out our previous musings on cigars from this collection here, here, and here). Each has its normal wrapper replaced with a Broadleaf wrapper. 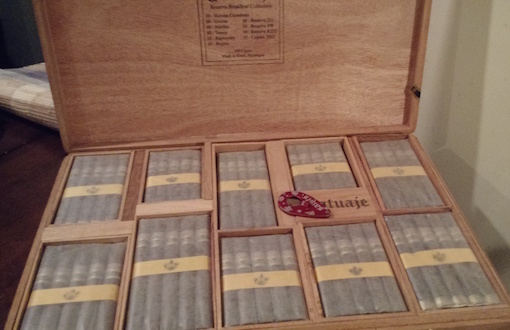 Fortunately, while the collection was set to only be available in 5,000 master cases of 100 (pictured above), Tatuaje has since said some will be released in boxes of ten of each size. Ordinarily, this cigar has an Ecuadorian wrapper around its Nicaraguan binder and filler tobaccos. This version, however, sports a thick, rustic, toothy, heavily veined Connecticut Broadleaf wrapper. Along with ample oils and rich pre-light notes of coca powder and dried apricot, Especiales also boasts a handsome triple-cap accented with a pigtail. The cigar is firm yet the cold draw is average. A helpful secondary band of black and gold denotes “Reserva Broadleaf” to eliminate any confusion with the original. After setting an even light, I find a medium-bodied, slightly spicy profile with a thick, chalky texture. Flavors include cayenne heat, espresso, caramel, leather, rye, and chocolate. The draw is impressively smooth for a lancero, the smoke production solid, the resting smoke sweet and aromatic, and the burn is off to a great start. As the cigar progresses, black pepper spice comes to the fore along with black cherry, cinnamon, and more pronounced espresso. The intensity builds at the midway point and beyond with the final third weighing in as medium- to full-bodied. All the while, the combustion properties remain solid. I will resist the temptation to compare this to the Ecuadorian-wrapped Seleccion de Cazador Especiales because (1) it has been too long since I’ve smoked that cigar and (2) I’d prefer to evaluate this Broadleaf Collection lanerco on its own merits. All told, this is a wonderful, balanced, satisfying cigar that commands your attention from light to nub. For that, I award it an excellent rating of four and a half stogies out of five.